As with many places that attract vast quantities of the world’s wealth, demand for property is excessively high in Switzerland. With many leading international businessmen seeking to benefit from the country’s relaxed attitude towards regulation and tax, prices for properties – both luxury and modest – have crept up in recent years. According to figures from UBS, over the last five years average house prices have jumped by 35 percent. In popular areas, such as beside Lake Geneva, prices have gone up by as much as 70 percent during that time. With historically low interest rates and an influx of cash into the banking industry, many think that high house prices are merely a natural consequence of the country’s economic model. So much wealth has poured into the country over the years, attracted by its secretive banking industry, that alongside almost zero percent interest rates it is inevitable that property will become highly sought after. The problem facing Switzerland is not exclusive. Other countries are also seeing dramatic rises in house prices, six years after a series of mortgage-related crashes caused the global financial crisis. Economist Nouriel Roubini wrote recently that he believes that there is a serious danger of housing bubbles emerging across the world: “…signs of frothiness, if not outright bubbles, are reappearing in housing markets in Switzerland, Sweden, Norway, Finland, France, Germany, Canada, Australia, New Zealand, and, back for an encore, the UK (well, London). In emerging markets, bubbles are appearing in Hong Kong, Singapore, China, and Israel, and in major urban centres in Turkey, India, Indonesia, and Brazil. Switzerland’s apparent crisis has been building up for longer than just a few years, however. Protests over the lack of affordable housing in the country have taken place this year, especially in the second-largest Swiss city Geneva. Towards the end of 2013, a series of rallies were organised in Geneva, where hundreds of protestors complained about the shortage of affordable housing and lack of cheap accommodation. A particular complaint was at the worryingly low vacancy rate that has sat at around 0.2 percent for the last decade – far below the two percent that is seen as healthy for most cities. The government toughened mortgage-lending laws in 2012 in an effort to dampen the market, while the country’s central bank, Swiss National Bank (SNB), has repeatedly warned that the market is overheating to such a level that a correction is inevitable. Last year, SNP chief Thomas Jordan requested a bugger to be introduced for Swiss banks, forcing them to hold an additional one percent of risk-weighted assets to stave off the potential dangers of the housing boom. However, this is not the first time that the country experienced such steady growth for its property industry. In 1989, the country saw real estate values rise dramatically, before a sudden collapse during the 1990s that continued until the year 2000. Those values have continued to rise at an average level of 42 percent since the turn of the century. Writing on his Roubini Monitor website in March, Roubini said that while Swiss house prices were getting close to the levels seen during the 1990s, other considerations mean that it is perhaps not set to experience the collapse of before. Preventing the sort of crash that occurred during the late 1990s is obviously something that the government has been striving to do. Roubini says that even though a number of regions in Switzerland appear to be on the verge of housing bubbles, it is more likely that things will ease off in the coming months. Another interesting shift in the country to come about in recent months is the change to its banking laws. With an estimated $2.2trn of offshore wealth in the country, many governments around the world have long called for Switzerland to abandon its secretive banking laws, so that they can see where their wealthier citizens are stashing their cash. In October last year, the Swiss Government agreed to share financial information with almost 60 countries, which could in turn lead to many wealthy clients moving their money out of the country. This could certainly lead to Swiss properties being discarded as well. 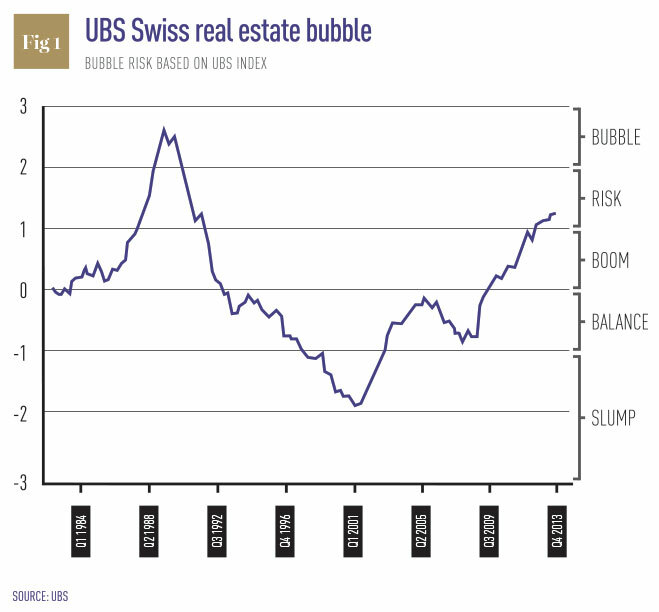 Investing in Swiss real estate has certainly proven lucrative for those lucky enough to enter into the market at the turn of the century, but with prices continuing to skyrocket over the last decade, some sort of correction is almost inevitable. Certainly the lack of affordable housing is something that needs to be addressed by the government, and the recent changes to banking laws that will enforce greater transparency might cause some of the overseas wealth to depart, helping to force down prices. Whether it is as sharp and dramatic a drop as the one seen during the 1990s remains to be seen.